Our food truck serves casual gourmet Greek/Mediterranean food. Our theme surrounds utilizing Phyllo dough, the rich and buttery Greek pastry dough filled with a variety of food items. We have the traditional Spanakopita (Spinach & Cheese Filled Phyllo Triangles), and other innovate flavors of Sausage & Cheese and Buffalo Chicken. In addition, we serve traditional Greek and Mediterranean items such as Lamb Meatball Sliders, Souvlaki (Brother to the Gyro), Lollipop Lamb Chops (Award Winning), Greek Salad, Pastitsio (Greek Lasagna), Stuffed Sweet Peppers, Gazpacho, and Baklava. We cater to the growing food truck marketplace in the Tri-State Area, with a concentration of special events and food festivals, micro-breweries and wineries. Phyllodelphia Greek and Mediterranean has some exciting news to share ! Do you love our Spanakopita and Baklava??? Many of you have told us you wished you could purchase some for home! Well now you can! Phyllodelphia has received the regulatory approval to sell our Spanakopita and Baklava for wholesale distribution! The wonderful flavors that you have tasted and loved from our Award Winning Phyllodelphia Greek and Mediterranean Food Truck are now available to share with family and friends. We will have packages available for purchase off the truck or contact us through our website to arrange a pickup date and time at our West Chester Facility. Just in time for the Holidays, give the gift of a Gourmet Sweet Dessert or stock up on some Frozen Spanakopita and bake off for that party you are hosting or attending. Baklava is purchased frozen also, so stock up now, and just thaw before serving. We are unique in the Philadelphia region by specializing in Phyllo dough, a rich and buttery Greek pastry. We fill the phyllo dough with an assortment of mixtures from the traditional spinach and cheese to innovative recipes of explosive flavors. The portability of our mobile service can provide access to large volume of customers who are searching for food options that are flavorful and for the foodies that are fans of Greek/Mediterranean cooking. The warmer weather has hit, and it’s natural for the mind to start to wander to exotic destinations, islands surrounded by the glistening sea and oceanside tables abundant with local fare. 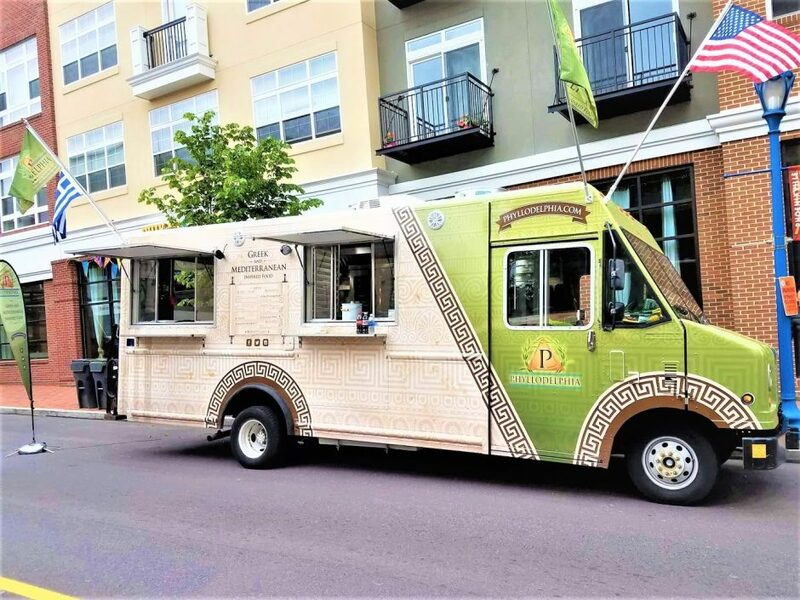 Now locals can travel to Greece and the Mediterranean through their tastebuds at the Phyllodelphia food truck, run by husband-and-wife duo Greg and Terry Daglis. More than 120 supporters, friends, and guests joined us at International House Philadelphia on April 18, 2016 for our 14th annual Taste of Success cook-off/bake-off competition. Twelve up-and-coming talented entrepreneurs in the food industry offered tastes of delicious appetizers and desserts, and were judged by some of Philadelphia’s finest chefs and restaurateurs (Tim Spinner, Michael Sultan, and Michael Mantia). 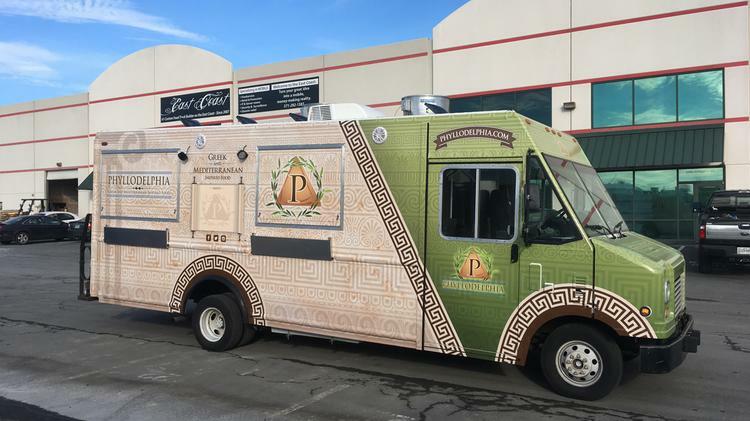 A family-owned food truck — a co-owner of which had skin in the culinary game at the Jersey Shore for years — have gotten the OK to prepare food and finally hit the road with spanakopita, pastichio and other popular Greek dishes.